Lets start off with the looks of this notebook. It is a leather bound notebook that comes in a wide range of colours. You can even have your cover laser etched which I think is pretty cool and unique. By pure fluke the one I had sent to me is in one of my favorite colours.....GREEN! 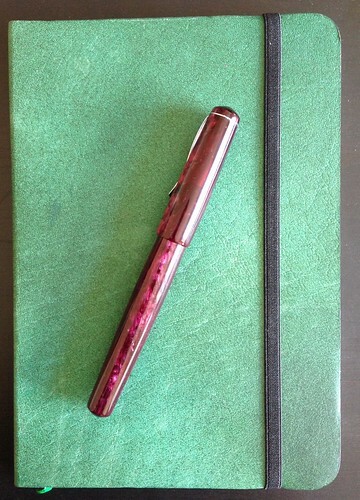 It is a nice emerald green colour and the leather marks easily which adds to the look, notebooks are meant to be knocked around and marked. The cover is pretty flexible and held closed with a black elastic band. To mark what page you are at there is a thin bright green piece of cloth. The paper used for mine is 140 gsm cartridge grade. This makes the pages pretty thick but I would expect this as it is a sketch notebook. You would want a thicker page to help with coping with various sketching materials you throw at it. You can get the following paper options; Plain, Ruled, Sketch, Dot Grid, Fountain and Watercolour. One thing I did notice while leafing through the pages was that certain pages do have very tiny marks on them. It doesn’t appear on all of the pages but on quiet a few. Upon reading other reviews while waiting to receive mine via the post, I did see that some people had reported binding issues. 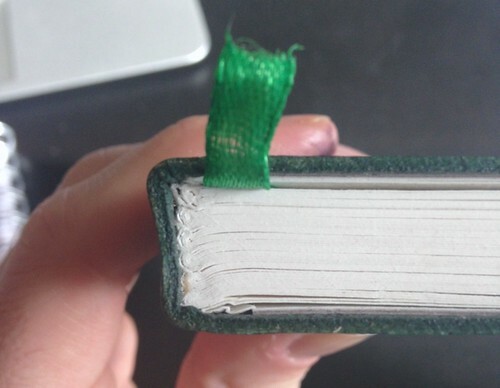 In particular, bonded page sections started to come away from the cover. I hadn’t come across this until very recently, While turning a page over it just started to come apart from the notebook. 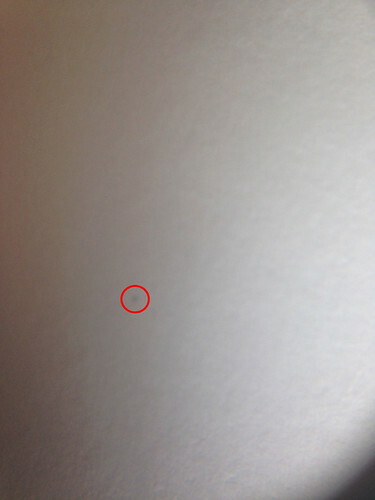 (The above photo shows the issue). I would expect this to happen if I had been using this book for a long period of time, not after a few weeks. 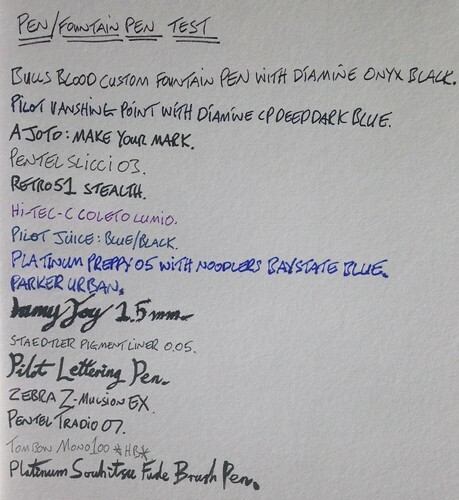 I have done a writing sample to show you how this paper handles various pens and even pencil. For the most, it handles ink pretty well. There was very little bleeding but only for a few pens. As this is a very thick paper you get very little show through when turning the page over. I did find drying times to be a tad bit long but again, this is probably down to the thick page. Overall I have found this notebook to be a mixed bag. On the one hand I really love the look and feel but on the other I have concerns with the binding. Hopefully mine is a one off. They are currently running a Indiegogo project which I have backed so I can have another look at the binding.